(Nanowerk News) Bruker’s Nano Surfaces Division today announced the release of scanning electrochemical microscopy (SECM) capability for its Dimension Icon® atomic force microscope (AFM) platform. Utilizing a proprietary probe design, Bruker’s new PeakForce SECM™ mode controls nanoelectrode tip position and tip-sample interaction with unprecedented precision to provide simultaneous capture of topographical, electrochemical, electrical, and mechanical maps. This capability provides access to previously unobtainable nanoscale observation of redox reactions and their kinetics. Now researchers are able to address vital evolution of materials for energy, environment, and biochemical sensors. PeakForce SECM dramatically improves, by orders of magnitude, the resolving power over traditional approaches. This opens the door to novel measurements on individual nanoparticles, nanophases, and nanopores. 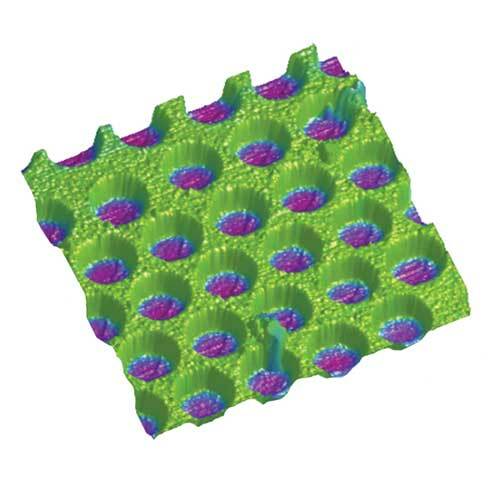 PeakForce SECM takes full advantage of Bruker’s exclusive PeakForce Tapping to deliver a new approach to SECM that extends its capability to nanoscale electrochemistry, electrical and mechanical mapping of a wide variety of samples, from soft biological systems to polymers. Bruker’s PeakForce SECM probes are batch-fabricated using proprietary methods to consistently produce a high-quality nanoelectrode. An optimized conductive path and special coating techniques eliminate pinholes, resulting in negligible leakage and capacitive currents. PeakForce SECM improves resolving power over traditional approaches by orders of magnitude, and opens the door to electrochemical measurements on individual nanoparticles, nanophases, and nanopores. For more than 50 years, Bruker has enabled scientists to make breakthrough discoveries and develop new applications that improve the quality of human life. Bruker’s high-performance, scientific research instruments and high-value analytical solutions enable scientists to explore life and materials at molecular, cellular and microscopic levels.